Potato salad is one of the staples of of the summer time menu. Small new baby potatoes are the most flavorful and beat the socks off the storage varieties in the stores. Our arugula is also way more flavorful than store bought arugula. I think it is the minerals in our soil that punch up the flavor. These two vegetables are dynamite in the traditional potato salad with a little kick! 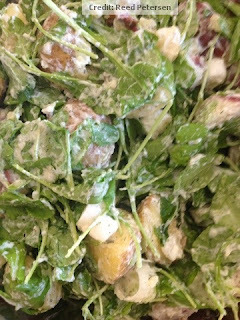 One of the keys to a good potato salad is to mix the dressing and the potatoes before the potatoes cool so the dressing is soaked up by the cooling potatoes. Fill a 5 quart pot 3/4 full of water. Bring to a boil and add potatoes. Simmer for 20-30 minutes or until you can pierce the potatoes easily with a knife or fork. Drain potatoes and put them back in the pot. Slice warm potatoes into quarters. Add to a large mixing bowl. Mix.together the yogurt and mayonnaise. Toss the potatoes with the dressing, then toss with the onions, arugula and dill. Season to taste with salt and pepper. Let rest in the refrigerator for an hour before serving.